J. and his co-workers scattered dozens of eggs inside the pages of CoffeeCup.com. Since they’ve announced the contest, visitors have been scouring the site, looking for the prizes. 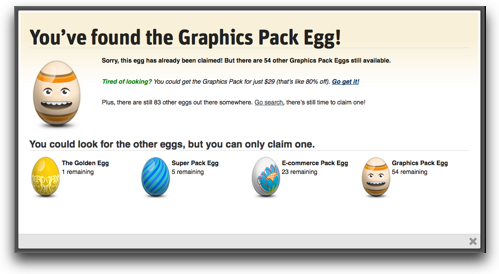 CoffeeCup’s team hid dozens of eggs to encourage site exploration. Meanwhile ThinkGeek.com, an e-commerce site filled with fun products for those who lean towards the geeky, offers a special promotion to recent customers. Through their previous purchases, those customers accumulated “geek points”. They now have a chance to redeem them for some of the site’s eclectic products, such as the 325-point Japanese Lucky Gold Poo (“Because everyone knows poo is lucky, especially when it’s golden.”) and the 400-point Bacon Salt. 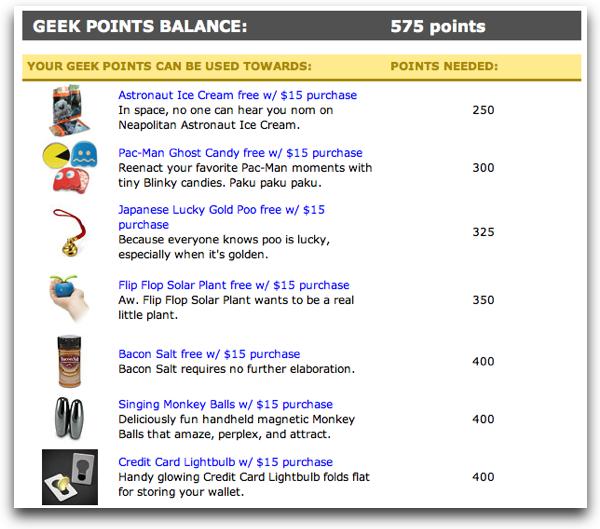 ThinkGeek emails highlight the site’s eclectic products while encouraging point redemption. While earning points or miles has been a staple of loyalty programs for the last 30 years, few outfits make it easy to redeem the points. ThinkGeek not only makes it easy, but also uses the opportunity to highlight some of their lesser-known products. It’s not a coincidence these devices at CoffeeCup and ThinkGeek are the key elements of many games. Finding hidden objects and accumulating points make games engaging and fun, keeping the player challenged and delivering feedback that shows progress. By utilizing these same elements in their site’s design, the designers at CoffeeCup and ThinkGeek are getting the same benefits. They are engaging their users and keeping them interested in their offerings, while helping the site meet its business objectives. These elements of play aren’t happening by accident. They are part of who we are as humans. We are a naturally curious species, who often enjoys a good challenge. Designers can leverage our traits and desires to encourage behavioral changes. For the last few years, Stephen Anderson has been cataloging the psychological principles behind the traits, to help designers see the possibilities. For example, Stephen says CoffeeCup uses the principles of challenge and curiosity to get users to explore their web site. By hiding the eggs in subtle places, they make the game of finding them more difficult. Moreover, by placing them in areas of the site where the users may not have ventured before, their exposure to the additional capabilities and functionality leverages their natural curiosity. As for Think Geek, they are leveraging feedback loops, humor effect, and status. Giving instant feedback on the points the shopper has accumulated, encourages them to purchase more. Humorous items are more easily (and fondly) remembered than non-humorous items. And the status of gathering more points gives the shoppers bragging rights for their peers. Stephen is quick to point out that the presence of eggs or geek points isn’t what is actually engaging the users. It’s the underlying psychological principles that those game elements are based on that are doing the heavy lifting here. As designers, we need to understand how to get the most out of those principles. LinkedIn claims filled in profiles are 40 times more likely to get new job opportunities. Since career advancement is a primary goal of LinkedIn users, and the site makes good money from professional recruiters who want access to their advanced functions, encouraging professionals to fill out their profiles is a key business objective. To help with this, Stephen points us to the Profile Completeness Meter. This little gauge, on the user’s profile page, points out the progress that the user has made towards completing all the information that makes LinkedIn’s job matching functionality work best. 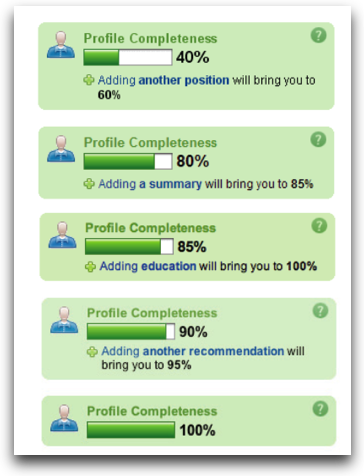 LinkedIn encourages the user to get their profile 100% complete. When the designers installed the meter, they immediately saw their users taking the time to fill out more of the profile. Each step tells the user what they need to complete to proceed to the next level. This design element works because of the principles of levels, challenges, and our innate need for completeness. Again, psychology drives the interaction. Stephen also told us the story of Sabre Holdings, who, like many large companies, was trying to encourage its employees to participate in their internal knowledge base. Corporate knowledge bases are notorious for having a difficult time encouraging employees to participate, both in adding and utilizing the information. Sabre’s system was no exception. The team implemented a new system, dubbed Sabre Town. They integrated gaming elements, like points, levels, and unlocked functionality, to the day-to-day usage. For example, answering questions earned the employee points, while being voted best answer earned additional points. Other functions, such as viewing other profiles and asking questions also earned points. As the employee accrued points, they were given broader access to functionality, such as posting more pictures to their profiles. 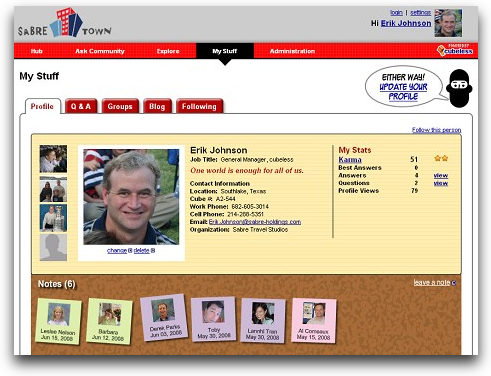 The profile pictures became a badge of honor, representing how engaged they were in the system. Sabre Town employees received karma points and levels for participating in the system. Stephen told us the higher usage yielded great results: Most questions are answered within 24 hours, with 60% of the questions being answered within the first hour of posting. Each question receives an average of 9 responses. Sabre has measured more than $150,000 in immediate, direct savings for the company from the system (with much greater benefits estimated, but not yet directly measured). Most interestingly, 65% of all Sabre employees become active Sabre Town members in the first 3 months, with more than 90% of all employees active today. The elements of play, such as points, levels, and challenges, are powerful for application development beyond games. But, as Stephen Anderson correctly points out, it’s not the game elements themselves, but the principles behind them. Once we master the principles, we can see the types of improvements that LinkedIn, Sabre Town, ThinkGeek, and CoffeeCup have seen. Published here on March 31, 2010.